If you are seeing this web-site, you may not think that the war was caused because Japan went crazy or Japan had an ambition to expand its territory. You may say that the war was caused because the U.S. prohibited exporting materials to Japan and provoked Japan for the war, which may be a passing mark. If you know that the spies among the Japanese military and political leaders worked and provoked the war, you may be rather advanced. However in reality, a much larger spy operation was done in the U.S. In recent years, some of the past classified documents have been exposed, through which the truth of the various incidents has been disclosed. As one of the biggest events was that a spying operation of the Soviet Union was exposed by Venona project. 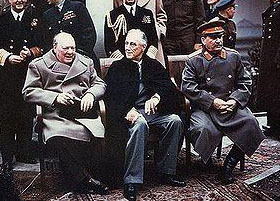 The Soviet Union, an ally during the II World War, had sent hundreds of spies to the U.S. and had stolen all kinds of classified information in diplomacy, military, and industries. Roosebelt administration in those days was completely under the influence of the operation of the Soviet Union. And the fact that American military secrecy was leaked to the Soviet Union came as a great shock to the historians in the world. There were more than 300 spies from the Soviet Union around close advisers of Roosebelt and others. Many campaigns were done so that the U.S. may like China and hate Japan, involving mass media in the U.S. In those days, Japan was fighting the threat of the communism in the East Asia. Therefore, if Japan were gone, it would be natural that the East Asia should go communist. The U.S. should have made allies with Japan, but was made to become hostile against Japan instead. The history after that was that Japan lost the war, then the Soviet Union invaded into Manchuria easily as you all know, and People’s Republic of China was born and it made half of the Korea communist. Today, it is said that Cominterun was dispersed, and China and Russia left communism. However, the power behind is still active. If our eyes are not open to the truth and if we cannot obtain a correct history view, there may be wrong political judgment even in the present time.